…and that’s too many things to plan. I know I should focus on work and let the chores fall where they may. It’s the never-ending battle between the immediate sense of accomplishment I feel when I do something around the house and the mix of emotions related to writing: accomplishment, but also aggravation, that feeling of wandering lost in the woods because one word after the other–what’s up with that? My reissued light fantasy stories, Continuing Education and 8 rms., full bsmt., are now available at Amazon as well as BookView Café. Upcoming contest! From 7-14 November, you can enter for a chance to win ebooks of GIDEON and over 30 other thrillers AND a Kindle Fire. I will post the link as soon as the contest goes live. 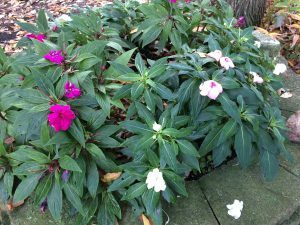 No hard freeze yet in far NE Illinois, which means I still have flowers. The mums have faded and the hibiscus are losing their leaves. But the begonias in the planter are still plugging along despite nights in the 40s and squirrels digging holes in the soft dirt. It’s nice to see shots of pink and white and leafy greenery amid all the warm shades, the yellow, orange and brown. I’m going to miss them when they’re gone. ‘Tis the season, so pumpkin spice is everywhere. I’m not a fan of the flavor in coffee and tea, but I do like pumpkin pie. So when I found a recipe for baked oatmeal with pumpkin, I decided to give it a shot. I used regular milk instead of almond milk, whole wheat flour instead of white whole wheat, added extra spices, and used pecans instead of walnuts. Imagine not-too-sweet pumpkin pie. A good way to start a chilly day. Definitely a keeper. ← Previous Previous post: Re-release day!